ข้อที่ 7. ตามมาตราที่ 7 ผู้ใดทำการเพาะปลูกต้นยาสูบ ต้องได้รับอนุญาตจาก………..
8. 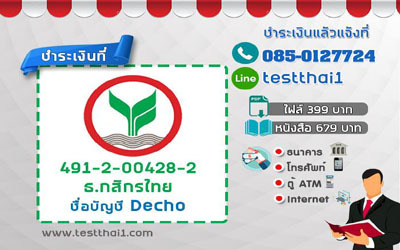 น้ำพริก : ผักจิ้ม ลอดช่อง : ? 9. น้ำ : กระหาย ข้าว : ? 10. ท้องฟ้า : ดาว : ห้องสมุด ? 16. At the dinner table, you want some salt but the salt shaker is right in front of your friend. You say to her, "............... ."
1.Don't use the salt. I need it too. 2.Would you please pass the salt? 3.You should not take all of the salt. 4.I would like some salt. Do you want some? 17. Somchai asks for a stapler but you have a paper clip. You say to him, "............"
1.That's it. 2.Will this do? 3.How is it? 4.Here you are. 18. You want your boss to allow you to be away from the office next Monday to celebrate your house-warming party. You say, "............."
1.Let's take next Monday off. 2.May I take next Monday off? 3.How about taking next Monday off? 4.What's the matter with taking Monday off? 19. Pauline lost her luggage. She went to see the airlines officer. She said, "............. ."
20. What is true about the Ear-Mate-63? 1.It is cheaper than other products of the same kind. 2.It is more expensive but its quality is much better. 3.It is about the same price but its quality is far better. 4.It is about the same price and quality but it offers a better service. 21.Which section in a magazine can you find this article? 22. "Do unto others as you would have them do unto you." What does this sentence mean? We should ........... .
23. "Do unto others as you would have them do unto you." What is the purpose of this saying? 24. Your friend invites you to a party. You would like to go but you're not sure if you can go. So you say, "............. ."
25. You are new in town and want to buy sone milk. You can ask someome on the road, "............?"